We found the Exmouth Arms, a busy corner pub with an eclectic and varied clientele, as we explored the area north of our apartment. It was a bustling little with a suprising variety of ages; an older gentleman, looking dapper wearing a dark grey suit and neatly trimmed beard, enjoyed a half pint almost meditatively while some twenty-something's shared a lively discussion over their own pints. 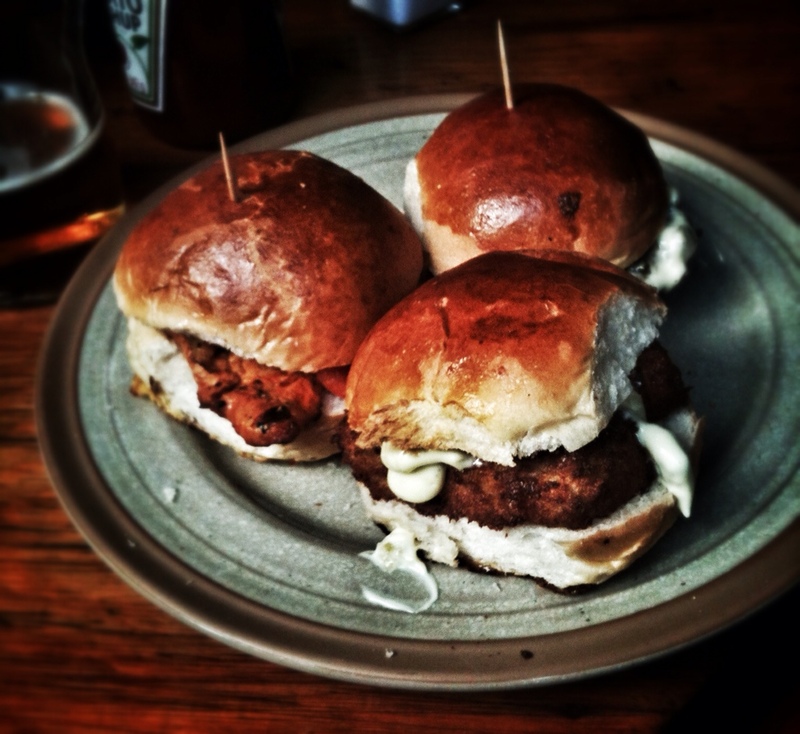 I had a plate of three exquisite sliders for dinner. These sliders were not just minimized simple greasy cheeseburgers, but instead were creative combinations that significantly impressed me. I feasted upon the Lamb & Feta Patty with Cilantro Mayo, Fish Finger with Tartare Sauce, and Smoked Paprika Chicken & Peppers. The little sandwiches were a perfect start to my British mealtime. The sauces complemented the meat and fish perfectly, bringing out the flavors of the lamb particularly well, and even adding their own nuances to the mix. The paprika punctuated the chicken's smoky flavor and the peppers also added their own smoky flavor. The buttery bread used as the buns were quite good, working as a neutral background and absorbing the sauces and juices without falling apart. All in all, the Exmouth Arms presented a good meal at a reasonable price in a bustling, interesting environment. The creative reimagining of the classic slider was quite delicious and a nice start to my abroad eating experience. Moved In, and the First Adventure!